The agenda for the meeting must be created early. The objective of the meeting must be defined by providing a short and clear summary of the discussions. The most important issues which are likely to be time-consuming should be prioritized. The list of participants and their responsibilities must be clarified by the organizers. 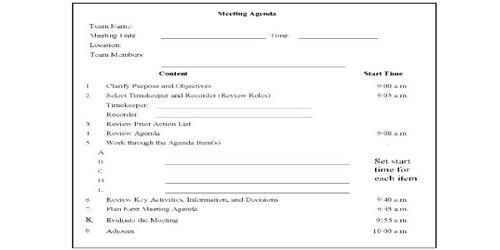 Departmental meeting agendas are between heads of different departments. 2) Member and guest roaster sign in an introduction.